Outline Castiel tries to keep the angel tablet from Naomi, but is captured by Crowley who takes the tablet. Sam and Dean find Metatron. Kevin is at work on Garth's boat, working on translating the demon tablet when Sam and Dean arrive, announcing that they have managed to trick Crowley out of the other half of the tablet. As they leave the boat, Sam and Dean transform - they are actually demons working under Crowley's direction. The boat is merely a construct of Crowley's to prevent Kevin from realizing he's been kidnapped. In the Bunker, Dean is concerned about Sam's worsening health. Sam tries to explain to Dean that he's not just sick from the trials, they are transforming him. An email arrives with a video from Kevin - triggered to be sent if he didn't reset the password once a week. In the video a distraught Kevin reveals he's probably taken by Crowley, but he knows he will not reveal what he's translated to him. He also forwards all his translation notes to Sam and Dean. While reading Kevin's notes from his translation work on the demon tablet , Sam notices a recurring symbol which appears to be Metatron's signature. It is familiar to him from a course he took at Stanford on Native American art. It's a petroglyph from a tribe in Colorado called the Two Rivers. As the tribe is supposed to be protected by the Messenger of God, Sam and Dean realize this is where they might find Metatron and head to have a look. Naomi is continuing her search for Castiel and the angel tablet. Castiel has been hiding by choosing a different Biggerson's to go to when the angels Ion and Esper get close, leaving them unable to locate him. Under orders from Naomi they murder everyone in a Santa Fe Biggerson's location to lure him there, except the waitress Kara whose eyes Ion burns out and gives the message of "You have to stop" to tell Castiel. They catch him, and Naomi arrives. Ion is sent to search every Biggerson's for the tablet unsuccessfully. When he returns Crowley shows up and shoots Castiel in the gut, Esper in the neck, and Ion in the shoulder with a gun loaded with bullets made from a melted down angel blade. He tries to shoot Naomi but she disappears. Ion is revealed as an agent of Crowley's and together they teleport with Castiel to Crowley's headquarters. Crowley reveals that he knows where the Angel Tablet is, that he thinks that having realized its proximity protects him from Naomi's control, Cas still has the tablet with him. Crowley reaches inside Castiel's gut and pulls out the tablet. Kevin has realized the truth of his incarceration and under the pretense of sending them for his half of the tablet, sends the demons posing as Sam and Dean into a devil's trap. While Crowley goes to confront Kevin, Ion talks to Castiel about how the angels have been mind-controlled and memory-wiped for a long time, and it was apparent he was miserable and frustrated with the situation. Castiel digs the bullet out of his wound and catching Ion by surprise, kills him by shoving the bullet into his eye. As they check into a hotel, Sam health begins deteriorating, hearing noises, developing a fever, and having vivid memory flashbacks to his childhood. Dean visits a local museum, where the curator tells him that the Native American tribe was led by a man who gave them a bounty in return for their stories. Noticing an old photo features the hotel manager, seemingly unaged, Dean realizes that they may be close to Metatron. 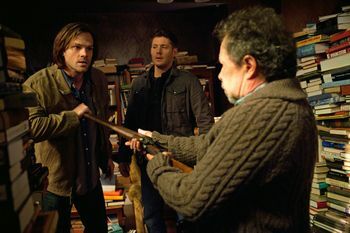 Sam and Dean find Metatron in a hotel room, surrounded by thousands of books. He is unaware of any of the events related to Heaven, or Lucifer and the Apocalypse and hasn't even heard of the Winchesters. He explains that he left Heaven to protect the tablets and himself from the archangels who want to use them to take over the universe. Metatron further explains that as Sam has passed two of the trials, he is starting to resonate with the tablets, and with Metatron, allowing him to sense both when he is in close proximity. Sam and Dean are angry at him for ignoring all the suffering wrought by Heaven and the angels and tell him about Kevin Tran who they believe is dead as a result. Driving back to the Bunker, Dean is seeking reassurance from Sam that when he completes the last trial, he'll be well again, but the conversation is interrupted as they stop to avoid hitting a person lying hurt on the road. It's Castiel. Crowley: So, it's three trials. Three trials and the Winchesters get to lock the door on me. Ha! You. Fake Sam. If you're gonna tip our hand, I'll have to scrub Kevin's short-term memory again. And that's risky, so watch the patois in there. Crowley: Your slang. Special K, nose to the God-stone, that's the way Dean speaks. Sam is... more basic, more sincere. Remember, I want two distinct, authentic characterizations. Dean: Alright, here we go. John Winchester's famous cure-all kitchen sink stew. There you go. Enough cayenne pepper in there to burn your lips off, just like dad used to make. Sam: This isn't a cold. Or a fever, or whatever it is you're supposed to feed. This is part of it all. Those first two trials... they're not just things I did. They're doing something to me. They're changing me, Dean. Kevin: Sam, Dean. I've set up this message with some software on a remote server so it'd send itself to you if I didn't reset it with a command once a week. Which means I didn't reset it this week. And there's only one reason I wouldn't. Which means if you're watching this, then I... then I— I'm dead. I'm dead, you bastards! So screw you, screw God and everybody in between! Crowley must've gotten to me. And the one thing I know is that I won't break this time. Not sure how I know, but— but I do. I've been uploading all my notes, the translations, I'm sending you the links so you can get all of it. You guys are gonna have to try to figure out the rest. I'm sorry. I know it was my job, but I— but I couldn't... I'm sorry. Perry: I swear to God, Lance, the guy just disappeared. Lance: You on that crack again, Perry? Naomi: Ion, tell me that you have good news. Ion: He's using a clever tactic. It's a restaurant called Biggerson's. The humans have built hundreds of them, almost exactly alike. Ion: It's their sameness. Castiel is using it against us. Now, we try to orient ourselves, but it's as if we're in every Biggerson's at once — trapped in a quantum superposition. Now, he chooses which to go to next, that's what's giving him the edge. Naomi: You're saying that you can't catch him. Ion: There's, there's just so many Biggerson's. Naomi: Very well. You say he can't be caught? Then we will simply have to make him stop. Naomi: You're the famous spanner in the works. Honestly, I think you came off the line with a crack in your chassis. You have never done what you were told. Not completely. You don't even die right, do you? Where is the angel tablet, Castiel? Sam: Hey, you remember when uh... when dad took us to the bottom of the Grand Canyon, on that pack-mule ride? Sam: And your, uh... your mule kept farting, just— l-letting go, like, gale force? Dean: Dude, you were like, four years old. I barely remember that. Sam: You rode a farty donkey. Sam: What, you really haven't heard of us? What kind of angel are you, we're — we're the freaking Winchesters. Crowley: You little prat. Having fun yet? Crowley: Am I seeing this? How did you figure it out? Kevin: It started when they forgot the secret knock. But really, it— it was the way they acted. I don't think on their best day Sam and Dean would go into town and get me a barbecue dinner, not when there are leftover burritos in the fridge. Crowley: So... my demons were too polite? Crowley: Well, I'll be a son of a whore. Metatron: I'm not one of them. I'm not an archangel. Really more run-of-the-mill. I worked in the secretarial pool before God chose me to take down the Word. Anyway, he... seemed very worried about his work, what would happen to it when he left, so he had me write down instructions. Then, he was gone. After that, the archangels took over. And they cried, and they wailed. They wanted their father back. I mean, we all did. But then... then they started to scheme. The archangels decided if they couldn't have Dad, they'd take over the universe themselves. But they couldn't do anything that big without the Word of God. So I began to realize, maybe they would realize... they needed me. Ion: You soldiers, down in the garrison, at least they let you believe the lie. Upstairs, working for Naomi, working in intelligence, we had no option but to live in the dirt. She never reset me completely. I always knew too much, I had to— I had to do my job. Dean: So you have been holed up here, or, or, or in a wigwam, or before that in some cave, listening to stories, reading books? Metatron: And it was something to watch. What you brought to His Earth, all the mayhem, the murder. Just the raw, wild invention of God's naked apes... it was mind-blowing. But really... really, it was your storytelling. That is the true flower of free will. At least as you've mastered it so far. When you create stories, you become gods, of tiny, intricate dimensions unto themselves. So many worlds! I have read... as much as it's possible for an angel to read, and I haven't caught up. Metatron: You really intend on closing the doors of Hell? Dean: Seems like the thing to do, don't it? Metatron: It's your choice. And that's what this has all been about, the choices your kind make. But you're gonna have to weigh that choice. Ask yourself: what is it going to take to do this, and what will the world be like after it's done? Dean: Cure a demon. Okay, ignoring the fact that I have no idea what that actually means, if we — if we do this, you get better, right? I mean, you stop trying to cough up a lung, and, and, and bumping into furniture? Sam: I feel better, yeah, um, just having a direction to move in. The title of the episode is based on the 1963 movie The Great Escape about Allied POWs escaping a German prison camp in World War II. Demon Sam: So Special K, you keep your nose to the God-stone. Special K is a brand of cereal and also the nickname for Ketamine a veterinary tranquilizer also used as a party drug. Castiel: We were supposed to be their shepherds, not their murderers. Naomi: Not always, angel. There was that day, back in Egypt, not so long ago, where we slew every first-born infant whose door wasn't splashed with lamb's blood. And that was just PR. Naomi is referring to the story in the Hebrew Bible and the Qur'an, of when Moses freed the Israelites who were enslaved by the Egyptians. He tried to make a deal with the Pharaoh, and each time he refused to release the Israelites, God sent a plague. The ninth plague was the murder of all first born sons in Egypt by angels. The angels spared the Israelites' children, who they knew by the sign of the door lintel being marked with lamb's blood. The events are commemorated as the Jewish holiday of "Passover". Sam: Your, uh... your mule kept farting, just letting go, like, gale force? A gale is a strong wind, classified as between 7 and 10 on the Beaufort scale. Sam: I'm gonna follow the hotel manager, Dr. Scowley-scowl. He's like a villain from Scooby-Doo. Scooby-Doo is an American cartoon franchise that was first produced in 1969, named after the character of the dog of a group of teenagers. Together they solve supernatural mysteries. Sam might be referring to the particular villain Buck Masters who appeared as the The Indian Witch Doctor. Dean: No, hey, uh, little big man? You should get some rest. Little Big Man is the title of a 1970 western starring Dustin Hoffman. It is about a white man looking back on his life being raised by Indians. Demon Dean: Awesome. Uh, what's the 10-20? 10-20 is police radio code for "what is the location?" Sam: You used to read to me, um, when I was little, I— I mean, really little, from that— from that old, uh... Classics Illustrated comic book. You remember that? Sam: Knights of the Round Table. Had all of King Arthur's knights, and they were all on the quest for the Holy Grail. And I remember looking at this picture of Sir Galahad, and, and, and he was kneeling, and— and light streaming over his face, and— I remember... thinking, uh, I could never go on a quest like that. Because I'm not clean. I mean, I w— I was just a little kid. You think... maybe I knew? I mean, deep down, that— I had... demon blood in me, and about the evil of it, and that I'm— wasn't pure? Classics Illustrated was a series which adapted literary classics into comic books. It was published from 1931 to 1971. Issue 108 was Knights of the Round Table. Crowley: You know what? I've already won. I have the angel tablet, you little smudge. And I got deals and plans up the jacksie. The motel Sam and Dean find Metatron at is called the Two Rivers Motel. Dean: Yeah, you know, all this driving back and forth across country, you know I've never been to the Grand Canyon? Though it can be interpreted that Dean, as well as Sam, were too young to remember.